Zeus: Master of Olympus is the fifth full title of the City Building series developed by Impressions Games and published by Sierra On-Line. Like previous titles, Zeus focuses on the building and development of a city in ancient times, this time in Ancient Greece. It features some changes to the Caesar III engine, most notably the new housing blocks, now dividing "common" and "elite" housing from the start, and more detailed walkers. As with other games in the series, the player must build a city on an empty plot of land of variable size and resources. The percentage objectives were replaced by direct goals, such as treasury size, production rate, a monster slaying or conquering other cities. Food resources in this game are urchins, fish, pork, cheese, carrots, onions, and wheat. Raw materials include wood (for triremes and sanctuary building), bronze (armor and sculptures), marble (sanctuary building), grapes (wine), olives (olive oil), and fleece (which can be directly sold to citizens). It is even possible to coin currency — if a silver mine is available, the player can construct a mint which will produce a limited amount of drachmas yearly. Food distribution works a bit differently from the previous games. An agora is built on a road, and goods stands are placed on top of it. After the stand owner collects goods from a nearby granary or storehouse, a peddler will start roaming around roads distributing available goods. Other services must be provided to members of the city, such as culture, health care, and maintenance. Culture is attained by building colleges to train philosophers, gymnasiums for athletes and drama schools for actors, which in turn go (respectively) to podia, stadia, and theatres to entertain the city. Every year the Pan-Hellenic Games (including the Olympic Games every fourth year) are held, testing a different aspect of culture against that of the Greek world. Chances of winning are increased by the number of facilities and the potential aid of Apollo and cultural facilities. Health care is given by infirmaries, and buildings are kept in good order by maintenance offices. Housing has also been improved. Elite and regular housing are built separately and each requires and serves a different function. A regular house always occupies 2x2 tiles, contributes to the city workforce and its residents may serve as "rabble" to defend the city. The largest of these houses is the townhouse which requires food, fleece and olive oil. Elite houses are 4x4 tiles in size, must be built in high-desirability areas and well-stocked with food, fleece and olive oil. These houses eventually require wine, armour, and horses. They never contribute to the workforce, but provide elite soldiers to fight for the city. Buildings no longer dispatch walkers to look for labor. As soon as a building is placed, it will have access to the city's labor pool. Working citizens aren't differentiated by age. With a constant population, the amount of labor available remains constant for any amount of time, although changing the wages does change the available workforce as it encourages or discourages people from working. Rather than staging permanent military forces, the citizens must be called to arms from their houses when military activity is required. A palace must be built first and will hold the standards of each company under the player's command. The number, type, and size of companies depends on the amount of citizens and the type of housing they live in. Citizens in common housing will serve as rabble - lowly soldiers that throw rocks at enemies. Elite houses provide hoplites if they receive armor, and horsemen if they receive wine and horses in addition to armor. These items are distributed by the Agora. In order for an Elite House to reach maximum upgrade it must be near or have access to a stadium. While common citizens are called to war, they won't be able to work, decreasing the amount of labor available to the city. Elite houses don't contribute to workforce, so calling their residents to arms will not impact the city's labor. Towers may be built into walls and triremes may be constructed in wharves. Just like foot soldiers, towers and triremes are not active at all times, and must be manned if they are to function. This requires significant amount of labor. Trading is handled differently from the previous games. In order to trade, a trade building must be built for each city willing to trade. Caravans will only visit the Trade Post and trade ships will only visit the Pier dedicated to their home city. Additionally, the trade buildings have a large storage space attached to them. The trader will only buy and sell items from and to this space. The trade building will fetch the items it is told to export, and deliver imported goods to buildings or warehouses needing them. Cities in the world involve in a greater degree of politics. Each city may be an ally, rival, vassal or colony. This status determines whether the city trades with the player, pays tribute or is obliged to fulfill requests. The player can request or demand goods from cities, send gifts and attempt to plunder or conquer the city. Rather than a common favor/kingdom rating, each city has its own favor towards the player, although these may be related (for example, attacking an ally will make enemies respect the player more while allies will respect the player less). The favor of a certain city determines what requests it is willing to fulfill. Favor can be increased by fulfilling requests from that city or giving them gifts of goods that the city needs. To plunder or conquer a city, only hoplites, horsemen or special forces may be sent - rabble can't leave the player's city. A conquered city becomes a vassal and must pay tribute. Colonies are cities that are established in parallel to the parent city during an adventure. They also must pay tribute. However, a colony or vassal that is not treated very well may rebel against the player. When an enemy invades, the player has the option of surrendering, bribing the enemy or fighting to defend the city. If the player surrenders or attempts to fight but loses, he/she will be required to pay tribute to the attacking city. This continues until that city is beaten back (although being defeated twice means losing the game), or conquered. A successful defeat of an enemy permits the player to build a Commemorative Monument which is a high-appeal building. Even bribery is not regarded as an act of cowardice: the advisor tells the player that the bribe money was well spent and the Commemorative Monument can be built. Religion is referred to as mythology and plays a larger part in Zeus than in previous games. Gods and monsters may come to attack or defend the city, and heroes can be summoned to help against monsters or to be sent on Quests. Each god's status is set to friendly or hostile for the duration of an adventure. The player may build Sanctuaries to certain friendly gods. A sanctuary is built like a monument: an artisan is dispatched from his guild to the construction site, where he waits for marble, wood and statues to be delivered to progress with the construction. If the Sanctuary is finished and provided with occasional sacrifices, the god can be seen wandering the city occasionally blessing buildings, making them more effective. Certain sanctuaries come with additional resources; the Forge of Hephaestus harbors bronze deposits, the Arbor of Athena provides a grove of olive trees, the Garden of Demeter includes some arable land for farming, and the Gates of Hades create silver mines. The sanctuaries of Zeus and Apollo give the player access to oracular advice. If the city is invaded by foreign powers, Athena herself, Poseidon's Kraken and Hades's Cerberus will defend the city. Artemis and Ares grant two units of soldiers for the player to use as he sees fit — Amazons and Sparti respectively. If a player has a sanctuary to a higher-ranking god, the god will defeat invading gods of lesser power. The exception is Aphrodite, who can bring to heel Ares and Hephaestus (as well as Hermes and Dionysus, because of ranking). In the expansion, Hera is able to drive away Zeus. The player may pray at the Sanctuary for help and the god might accept the prayer. For example, Dionysus provides wine when prayed to, while Ares marches with the next army sent to battle in another city. An enemy god may appear in the city and wreak havoc, destroying or cursing buildings. Usually the curses have the opposite effect of the same god's blessing. The god may also send his/her monster to attack the city when the god is too busy. Some of the monsters can even come wild, not commanded by a god. Heroes may be summoned to a city by building the appropriate Hero's Hall. Before a hero will visit the city, certain requirements must be met. Some examples of such requirements are wine, Sanctuaries to certain gods or a level of cultural coverage. The summoned hero will fight the monster he/she can beat, help defend against invaders, or can be sent on campaigns or Quests that are given by gods. 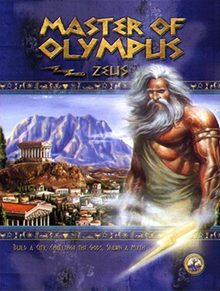 Zeus: Master of Olympus received generally favorable reviews with a rating of 87 on Metacritic. IGN reviewer Stephen Butts stated that he "had to tear [himself] away from [the game] to write the review." In May 2012 game was re-released on GOG.com together with its expansion as a part of the Acropolis bundle where it holds a 5-star rating. In 2018, Alice Bell of Rock, Paper, Shotgun included the game in the site's "Have You Played" series, describing it as "the perfect balance of beauty, difficulty, detail, and puns." As with Pharaoh, an expansion pack was released, named Poseidon: Master of Atlantis. The expansion includes new adventures based on the stories of Atlantis by Plato. An adventure editor was also included, although it had already been freely available on Impressions website. ^ a b "Zeus: Master of Olympus (pc: 2000): Review". Metacritic. Retrieved June 6, 2009. ^ nach0king (December 21, 2000). "Zeus : Master of Olympus Review". Eurogamer. Retrieved June 6, 2009. ^ a b Butts, Stephen (November 3, 2000). "Zeus: Master of Olympus Review". IGN. Retrieved June 6, 2009. ^ Wright, Brian (October 30, 2000). "Zeus: Master of Olympus". GamePro. Archived from the original on December 20, 2005. ^ Price, Tom (January 9, 2001). "Her-cu-les! Her-cu-les!". Computer Gaming World. Archived from the original on April 6, 2001. ^ Oxford, Adam (December 2000). "Colossal". PC Gamer UK (90). Archived from the original on June 1, 2002. ^ Markell, Dave (November 13, 2000). "Gods and Monsters and Fun". Computer Games Magazine. Archived from the original on August 15, 2004. Retrieved November 26, 2018. ^ Samuel, Jason (February 2001). "Finals; Zeus". Next Generation. Lifecycle 2, Vol. 3 (2): 84. ^ Bell, Alice (September 24, 2018). "Have You Played… Zeus: Master of Olympus?". Rock, Paper, Shotgun. Retrieved February 3, 2019. ^ Dulin, Ron (July 3, 2001). "Zeus Official Expansion: Poseidon Review". GameSpot. Retrieved February 10, 2019. ^ "Zeus Official Expansion: Poseidon". IGN. July 3, 2001. Retrieved February 10, 2019.